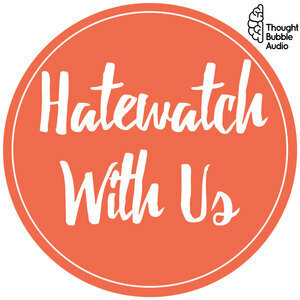 We found 10 episodes of Hatewatch With Us: A Variety Show for Sarcastic People with the tag “thought bubble”. It's the first NEW episode of our NEW PODCAST, Our Watch Has Ended: A Game Of Thrones Hatewatch. You can subscribe at our new feed by searching for Our Watch Has Ended anywhere you find podcasts! Subscribe there for weekly episodes all through season 8! It's been two years, but we are back at it with our favorite garbage show! Don't gaslight us about great houses, it's been a long time! As the hype builds, so do the brand partnerships, so we wanted to take a minute to talk about some of the crazy ways HBO has licensed Game of Thrones to trick you into BLEEDING FOR THE BRANDS. We discuss Oreo, Shake Shack, the American Red Cross, Mountain Dew, Urban Decay, Love Pop, Rolling Pins, Johnny Walker, and Spotify. How many houses are there? How do you fit a house on a cookie? We are bringing HOT LOOKS and HOT TAKES and dear god are we ready for this season to be over. Use the hashtag #hatewatchGOT to watch along with us! Thanks to a listener suggestion, we spend this week's episode down a rabbit hole known as the WB Then and Now, Pilot Palooza Bonus Round, Make Kirstie Watch An Everwood, or The Greg Berlanti Factor. We bring you in depth reporting such as show runner horoscopes, Comics vs RomComs, and Legends of Eurovision. Kirstie says "tonality" a lot so you know it has to be good! Then we finally talk about Kelsey's heart and soul, Everwood. Doc Brown comes to comfort us, and we sling some Hot Hallmark Takes and argue about Schitt's Creek. Like any small town, this episode has a lot of heart. Stay tuned for an announcement about our new project, pending the resolution of our endless struggle against A Major Podcast Distributer! It's the Five Star Podcast experience for the Five Star guest. Luxury! Social Media Moments! Relax and recharge in this chic episode with beautiful, expansive views of the Netflix shows Stay Here and Instant Hotel. Whether you love a knitting show or are looking for the opposite of shows about nice people only, this episode has something for every guest. Enjoy premium features such as Strong Sexual Content Barbie, a lesson on thrummed mittens, and Kirstie and Kelsey Google. Pilot Palooza coming next week, we swear!